Our in-house landscape software update means we can now save clients half the cost of producing a plot landscape scheme. Value: starting at just £7.00/plot for larger schemes. Quality: bespoke planting design for each plot, plus a cost estimate, ensuring the WOW factor on budget. Speed: our new in-house designed software guarantees you rapid turnaround times to fit your programme. Low Risk: our 30 years specialist residential experience ensures you receive quality results and reliability, (and all NHBC compliant). 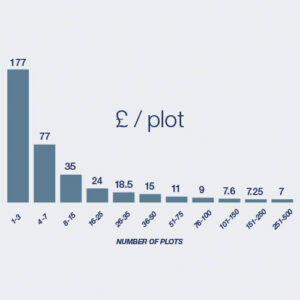 No Hidden Extras: layout amendments (per occasion) charged to max of 50% of the initial plot rate – but just on the affected plots i.e. from £3.50/plot. There is no better and faster service for such a low cost per plot in the UK. James Blake Associates also offers the same level of expertise to design your public open spaces.